In a dutch oven or large pot, heat oil over medium heat. Add the sausage and onion and cook about 5-7 minutes. Add carrots, celery, garlic, 2 tsp. salt, pepper, and red pepper flakes and cook for 7 minutes longer or until the veggies are tender. Add cabbage, greens, and tomatoes and cook for 7-10 minutes. Add the mashed beans, whole beans, and chicken stock. Bring to a boil, then reduce heat and simmer over low heat for another 20 to 30 minutes. Add salt if needed. Store in the fridge for the week. Saute onions, carrots and sweet potatoes in a little olive oil over medium heat until almost tender, about 10 minutes. These can be a little browned too. Immediately add orange zest, orange juice, cumin, cayenne, a pinch of salt, a dash of pepper, and the garlic. Saute a few minutes longer or until the juice has evaporated and the veggies are tender. Taste and salt if needed. Set aside. Saute the zucchini and green beans in a little olive oil over medium heat until tender, but not mushy. Salt and pepper to taste. Add to the carrots and potatoes and toss to combine. Store in the fridge for the week. Don’t make all your eggs on Sunday. Prepare a second batch on Wednesday so they still taste yummy on Friday! Place eggs gently in a saucepan and fill with cold water until 1 inch over their tops. Bring to boil over high heat, immediately remove from the heat, cover the pan and let it sit for 18 minutes. Run cold water over the eggs to stop the cooking. Peel, slice in half and scoop the yolks into a bowl. Add your favorite mustard, some greek yogurt, salt and pepper until smooth and to your liking. Add hot sauce or dill or rosemary to give it a little kick or clean freshness. Scoop a little filling back into each white and store for the week in the fridge. Toast the english muffins. Spread each side with peanut butter, top with banana slices and sprinkle with raisins. Reheat two portions of the stew in the microwave or on the stove. While that heats, cut the crust off of one large or 2 small slices of sourdough bread. Cut the inside of the bread into small chunks. Stir the bread cubes into the stew when its hot until the bread is fully absorbed by stew. Top each portion with Parmesan cheese and serve! In a very small saucepan, heat the stock, raisins, and a pinch of cinnamon, ginger and cumin over high heat until boiling. 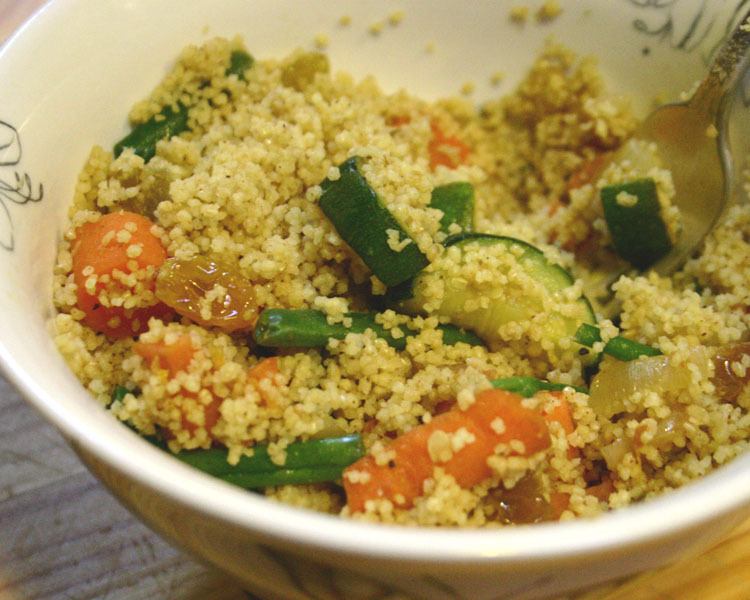 Add the couscous, stir quickly, remove from heat, cover and let stand 5 minutes. Fluff with a fork, drizzle with a touch of olive oil and fold in the warmed veggies. Serve! YUM on all accounts. 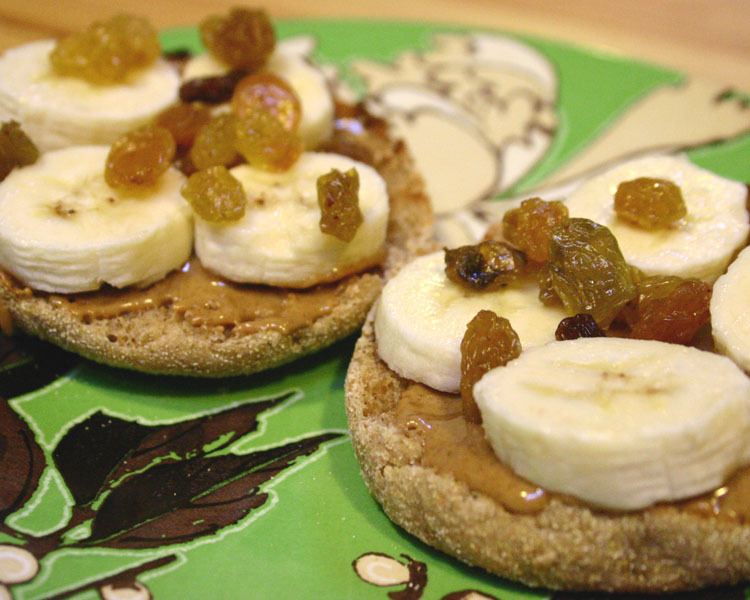 PB & bananas is the best combo ever (I love it with honey or agave). 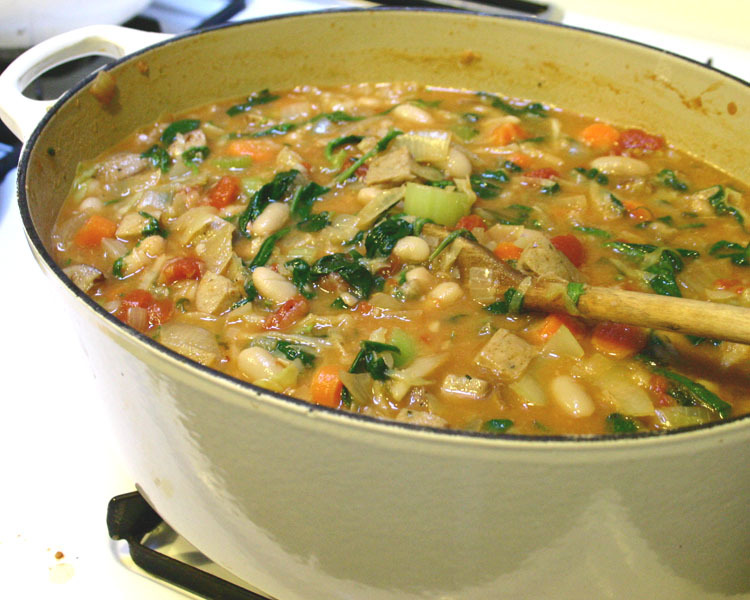 And the ribollita I am going to make this weekend with Gimme Lean fakey fake sausage. 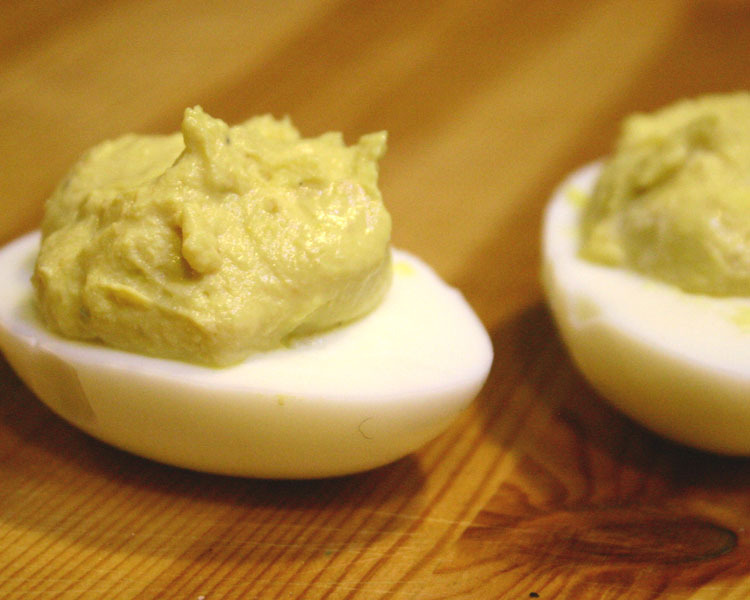 I am afraid to make deviled eggs ever because I will eat them all at once. No lie. Oh- and just in case you didn’t see it, be sure to scroll down to the recipe section at the end. You add bread cubes and cheese to the ribollita after you make the base on Sunday, but just before you eat. IT’S AWESOME.